Wigan Athletic somehow contrived to a turn an 89th-minute lead into another damaging defeat on the road at Reading that sees them slip further into the relegation mire. Joe Garner's strike just after the hour, turning in an overhead kick from Nick Powell - who had earlier opened the scoring - had looked like giving Latics their first away win in almost seven months. But Reading, who had equalised in first-half stoppage-time - had other ideas with a dramatic finale that gives them a lifeline at the bottom. Mo Barrow found the bottom corner from 30 yards with seconds of the 90 minutes remaining. And then, in the last of seven added minutes, Yakou Meite bundled home a corner to send the vast majority of the fans at the Madesji Stadium into raptures. Latics had only themselves to blame for not finishing off their opponents when they had the chance, with Powell, Massey, Sam Morsy and Reece James all being denied by Royals goalkeeper Emi Martinez. And with second-bottom Bolton beating fifth-bottom Millwall, sixth-bottom Latics stand only three points above the drop zone with 10 matches still to go. Reading had almost taken the lead with their first attack, Meite sending a fierce strike fizzing just over the top. 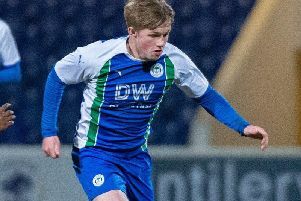 But Latics were also quickly into their stride and, after a breakdown in the home defence, Powell teed up Morsy, whose shot was blocked for a corner. Another lightning-fast break from Latics, stemming from a superb Michael Jacobs block, saw Nathan Byrne and Gavin Massey get Antonee Robinson away down the left. The American's cross was only inches over an unmarked Nick Powell at the far post, a real let-off for the home side. But Latics continued to look good on the counter, and they took the lead on 25 minutes with another swift raid. It was Jacobs who got away down the left, and his cross was steered home by Powell into the far corner. Jacobs then forced a decent save from Martinez as Latics attempted to turn the screw. But they were given a warning when Andy Yiadom's cross found Garath McCleary, who thankfully fired straight at Jamie Jones. That looked to be that for the first half but, in the five minutes, James conceded a free-kick right on the edge of the Latics box. And John Swift stepped up to curl a wonderful set-piece over the wall and into the top corner, with Jones getting nowhere near it. The visitors bounced back from the disappointment well, starting the second period brightly with Joe Garner teeing up Massey. However, Martinez did well to make a good save. From James' corner, the ball fell to Chey Dunkley, who took a swing with his left foot and it was only just wide of the far post. The home side were hanging on, though, and offering little to trouble the Latics defence. And the visitors regained their advantage on 64 minutes in bizarre fashion. Great work from Massey led to Powell having a shot blocked. The ball looped into the air and Powell tried an overhead kick that flew not towards goal but to the far post, where it was volleyed home clinically by Garner. It was almost 3-1 within seconds as Massey found Powell, who looked a certain scorer only for Martinez to make a quite incredible save at point-blank range. James almost took advantage of a total mix-up in the home defence, but his long-range effort rolled wide of the mark. Latics made a couple of changes to try to protect a couple of players still not quite fully match-fit, with Massey and Powell giving way to Kal Naismith and Leon Clarke. And still the visitors looked the more likely to score, with Sam Morsy forcing another fine save out of Martinez. But with time running out, Barrow fired past Jones to level the scoring. And there was to be a final sting in the tale, with Meite turning home a last-gasp corner to secure all three points.